FTC disclaimer: Many of my posts contain affiliate links where I receive a small commission of your purchase price for you starting your shopping here at no extra charge to you. I won a copy of this book in a giveaway, and received no compensation for running this giveaway. I love books! I especially love children's books. In fact, I love children's books so much that when I was a senior in college, I needed an elective. I decided to take children's literature so I could get college credit for reading children's books. We did have to study about what made a children's book quality literature, but I loved spending so much time in the children's section of the local library. A few of the books we were required to read were ones I already owned even though they were published after I was a child. I also love entering giveaways online. 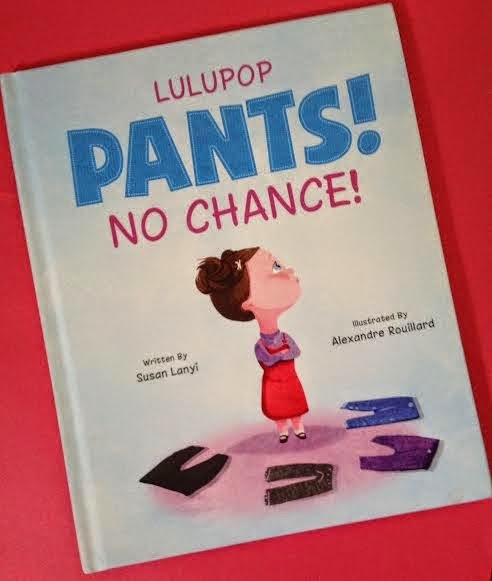 I recently saw a giveaway for the book Lulupop Pants! No Chance! and entered. I won, and when the book arrived, I settled in to read it. I was instantly charmed by the delightful illustrations. As I started reading, I realized this book had absolutely every trait of a good children's book according to my children's literature professor. Plus it is one of the most fun books I have come across in a long time. Lulupop never wants to wear pants -- she always wants to wear dresses. This is a great book with repetition with difference which we learned was very important as children love to anticipate what is coming next. The same thing happens every day for a week. Lulupop's mother brings her some type of pants. I loved how each day it was different -- leggings, jeans, overalls, etc. The days of the week are mentioned in order as well, starting with Monday. Each day Lulupop says "Pants! No chance!" (I love how she created a sing song way of saying no. I love rhyme.) Then Lulupop says something so silly and crazy that she would love to do instead of wearing pants. While I don't have children, I know this is something I would have giggled at to no end when I was a child. This is a book that teaches consequences of our actions. Sometimes it's best to wear pants, sometimes it's best to wear a dress. Lulupop has a week of things that aren't as fun as they could have been if she had worn pants. The end of the book Lulupop comes up with a solution and even creates her own word. I loved that because I was always creating my own words when I was little. I have to say Susan Layni hit the bullseye with with book. Often when I win a giveaway for a book, I will then pass it on to my library. This book, however, has been added to my personal collection and I hope to share it with many little girls over the years. My only complaint? Where was Susan Lanyi when I was a preschooler? I can tell you now that this would have been my favorite book! I loved this book so much I contacted the author and offered to do a giveaway for one copy of Pants! No chance! This giveaway ends April 21, 2015. It is open to the USA and Canada. One entry per person per day. my sister's little one that she is adopting~! My two 5-year-old kids love to read and would love this book. I would share it with my grandkids. I'd share with my son. I plan on sharing it with my daughters. I plan on sharing this book with my daughters. I'd share with my little girl, she adores books! I'd share this with nieces. My girls are probably a little too old, but I am sure my nieces would enjoy it! I would give it to my grandkids.